Finding just the right sitting position helps maintain proper posture and gives you the comfort needed to focus on important tasks. With a host of customizable settings, this modern adjustable office chair helps you feel great and get more done. Overall Dimensions: 39 3/4" to 43 1/4"H x 27 5/8"W x 27 5/8"D.
Weight capacity tested to support 250-lb. Coil-spring technology creates a comfortable seat. This mid-back desk chair has an airy mesh backing that provides breathability, so you can stay cool throughout the day. Contoured edge and seat in upholstered bonded leather for comfort and an elegant appearance. Plywood and steel frame delivers a stable base that is built to last. 1-touch adjustable seat height and height-adjustable arms let you find the proper position for your body. Adjustable tilt tension and a tilt lock ensure that you can focus forward when needed or kick back and relax during lunch. 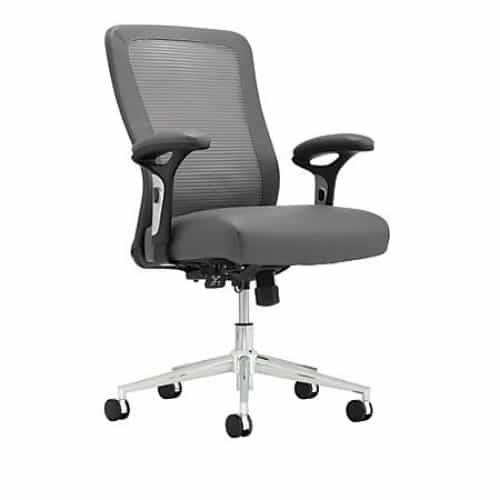 Padded arms provide arm and shoulder support as you work in this mesh mid-back chair. Comfortable chair! It also looks really nice in any office setting. And, as an added bonus, the staff was extremely friendly and knowledgeable. When style and comfort matter most, choose a Brenton Studio chair. Featuring an attractive two-tone ..